My favorite vegetables have always been the green ones. Broccoli, peas, edamame, spinach, peppers, zucchini…I could go on. And yet another favorite green food is pesto. Recently I made Spinach Pesto to make sure I used up all the spinach in my fridge before it went bad (and it was amazing). With that spinach pesto I made this dish, all green, all delicious. Enjoy my healthy, vibrant recipe for Greenoa Quinoa (fun fact: pronounced “keen-wah”)! Cook Quinoa according to directions on package. Mix quinoa and water in saucepan and heat until boiling. Lower to a simmer for 10-15 minutes or until water is absorbed and quinoa is light and fluffy. Set aside. Heat olive oil over medium heat in saute pan. Add garlic and saute for 1-2 minutes, or until fragrant and yellowed. Add in broccoli, peas, edamame, and pine nuts and sautee for 3-4 minutes. Turn heat to low. Mix quinoa and pesto sauce into the saute pan with the vegetables. Stir until all ingredients are well coated in the pesto sauce. Remove from heat. Spoon mixture into bowls, and top with desired amount of green onion, fresh basil, and parmesan cheese. 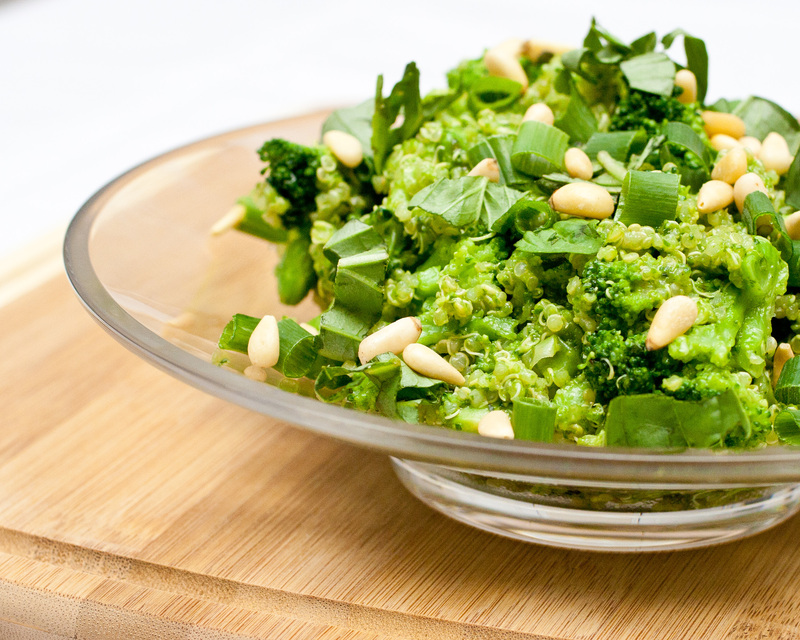 Enjoy this healthy, yet wonderfully savory, green dish!